Pam Palmater is a Mi’kmaw lawyer, Chair in Indigenous Governance at Ryerson University and mother of two. Last year, she was runner-up for the top job in First Nation politics; National Chief of the Assembly of First Nations. Following her unsuccessful bid to represent more than 600 First Nation Chiefs, she was quoted saying, “I wanted a revolution. And now we have a revolution.” She was speaking about the Idle No More movement. Palmater has become a recognizable face of the Indigenous protest movement that has blocked bridges, highways and rail traffic across the country and represented a strong voice against the destruction and continued privatization of natural resources. dandyhorse asked Palmater about the safety and security of our country’s natural resources and how safe it is biking in Ajax, Ontario, where she lives. dandyhorse: Do you ever wear heels while biking? Pam Palmater: I am now. DH: Tell us about biking in Ajax. PP: My preferred place to cycle with my family is along the waterfront in Ajax. The amazing waterfront trail shifts between open fields, lakefront, bird habitats and forested areas. Everyone, whether they’re cycling, walking, rollerblading or skateboarding, respects the environment and looks out for the safety of others. Generally, I cycle for exercise or for enjoyment with my two sons. We sometimes bring our bikes in to Toronto on the GO train. I’m a fair-weather cyclist. DH: When did you realize you were going to be an advocate? PP: It’s always been a part of my life; most of my brothers and sisters were involved in Indigenous advocacy efforts. They brought me along [to events] since I was a small child and instilled in me that I didn’t have a choice - that being Mi’maq meant I had certain responsibilities to my Nation. So, my work, research, publications, education, teaching, advocacy and personal life are all one. DH: What’s happening with Idle No More? PP: Idle No More is as active now as when it started in the fall of 2012. We’re putting more emphasis on public and community education activities to prepare for strategic direct action that will take place this spring and summer. Idle No More is a grassroots Indigenous movement that focuses on working with Canadians as our allies to protect our mutual rights and interests. When we signed treaties, we promised to come to each other’s aid in times of crisis and share the wealth and responsibility to protect our precious lands, waters and resources. By standing up for Indigenous Aboriginal treaty and inherent rights, we’re all standing up to protect the environment. A right to fish is not worth much if the lake is contaminated. DH: Why do you think Stephen Harper is so intent on ruining our country? PP: Harper is part of the fringe element of the Conservative party which has extremist views and does not believe in social justice, substantive equality, Aboriginal and treaty rights, cultural diversity, or protecting the environment. Harper’s focus on aggressive resource development shows his obsession with instant gratification – money now at the cost of the well-being of our future generations. First Nations are Canadians’ last hope at saving the land, waters, plants and animals for future generations, as we are the only ones with constitutional rights that can prevent unfettered destruction of the lands and waters we all rely on to survive. If the waters are too contaminated for First Nations to drink, they will be for Canadians as well. DH: In what other ways is the current government denying and ignoring concerns regarding the safety of Aboriginal peoples? PP: Indigenous peoples die prematurely — seven to twenty years earlier than Canadians — because of purposeful, chronic underfunding for essential human services like water, sanitation, food, housing and medical services. Add to this the hundreds of murdered and missing Indigenous women in this country that police have refused to treat seriously. Not to mention other safety issues like deaths of Indigenous peoples while in police custody, deaths of Indigenous children in foster care, and high suicide rates because of bleak conditions. DH: What can non-Aboriginals do to make the movement stronger? PP: It’s already quite a challenge for Indigenous peoples to carry this burden alone. It’s time Canadians stand beside us and use the wealth and privilege they have to learn more, demand more of their politicians, write letters of support, vote for justice, and refuse to buy from, work for, or support governments or industries which deny First Nations rights. 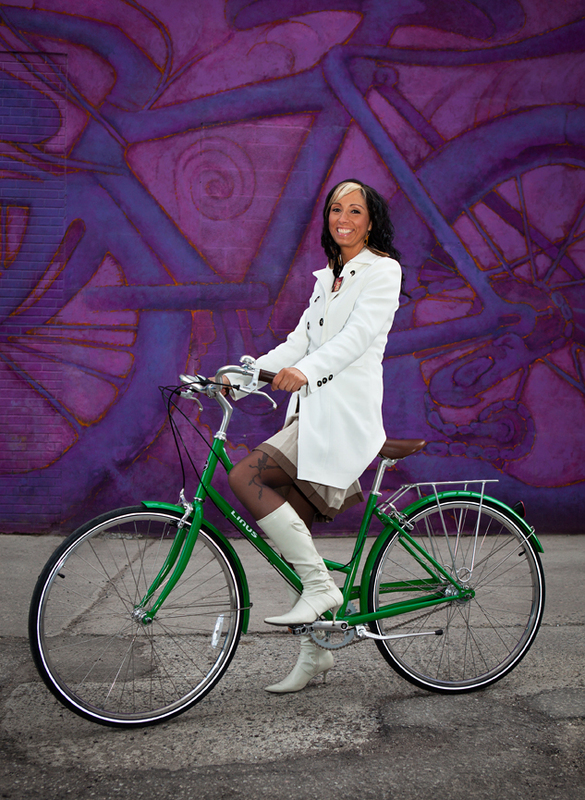 Pam posed with a green Linus bicycle, courtesy of Curbside Cycle, which was raffled at our launch party at Cine Cycle in July. Heels on Wheels is an original dandyhorse series of short Q&As with fashionable and influential pedal people. The photo below is of Molly Crealock in action for dandyhorse #10 (shooting our current homepage image) assisted by dandy editor Amelia Brown and shot on Ryerson campus. Photo by Tammy Thorne.